Poor water solubility remains main culprit for the formulation scientist which can be overcome by nanonization. Nanoemulsion is kinetically stable and isotropic system of two immiscible liquids in sub microne size range. Nanoemulsions are composed of oil droplets dispersed in an aqueous medium and stabilized by surfactant molecules. Advantages of nanoemulsions include increased drug loading and enhanced bioavailability. The methods used for the production of nanoemulsions include HPH, microfluidization; ultrasonication and spontaneous emulsification Nanoemulsions have widespread applications in different fields such as pharmaceutics, food technology and cosmetics. This article mainly focuses on its application. Perspective drug delivery systems can be defined as mechanisms to introduce therapeutic agents into the body. Chewing leaves and roots of medical plants and inhalation of soot from the burning of medical substances are examples of drug delivery from the earliest times. However, these primitive approaches of delivering drugs lacked a very basic need in drug delivery; that is, consistency and uniformity (a required drug dose). This led to the development of different drug delivery methods in the later part of the eighteenth and early nineteenth century. Those methods included pills, syrups, capsules, tablets, elixirs, solutions, extracts, emulsions, suspension, cachets, troches, lozenges, nebulizers, and many other traditional delivery mechanisms. Many of these delivery mechanisms use the drugs derived from plant extracts . As the technological advancements been made some new formulation approaches have been devised by the scientists. Most of the new chemical entities being invented pose the problem of poor solubility. Nanotechnology and nanoscience are widely seen as having a great potential to bring benefits to many areas of research and applications where poor solubility is an issue with API [2,3]. Nanoemulsions are part colloidal dispersions of two immiscible liquids . Although some lyotropic liquid crystalline phases, also known as ‘micellar phases’, ‘mesophases’, and ‘microemulsions’, may appear to be similar to nanoemulsions in composition and nanoscale structure, such phases are actually quite different. Lyotropic liquid crystals are equilibrium structures comprised of liquids and surfactant, such as lamellar sheets, hexagonally packed columns, and wormlike micellar phases that form spontaneously through thermodynamic self-assembly. By contrast, nanoemulsions do not form spontaneously; an external shear must be applied to rupture larger droplets into smaller ones. Compared to micro emulsion phases, relatively little is known about creating and controlling nano-emulsions. This is primarily because extreme shear, well beyond the reach of ordinary mixing devices, must be applied to overcome the effects of surface tension to rupture the droplets into the nanoscale regime . Nanoemulsion droplet sizes fall typically in the range of 20-200nm and shows narrow size distribution . Since, the preparation of the first nanoemulsion in 1940s, it can be of three types such as oil-in-water (O/W), water-in-oil (W/O), and bi-continuous. The transformation between these three types can be achieved by varying the components of the emulsions. Each type of the nanoemulsions serves as a template for preparing polymer latex particles, Nano porous polymeric solids etc. Apart from this, the nanoemulsions with pharmaceutically accepted ingredients are utilized in the development of drug formulations for oral drug delivery. Phase behavior studies have shown that the size of the droplets is governed by the surfactant phase structure (bicontinuous micro emulsion or lamellar) at the inversion point induced by either temperature or composition. Studies on Nanoemulsion formation by the phase inversion temperature method have shown a relationship between minimum droplet size and complete solubilization of the oil in a microemulsion bicontinuous phase independently of whether the initial phase equilibrium is single or multiphase [4-7]. Nanoemulsion possesses stability of outstanding application like it waiver the destabilization process of emulsion i.e., creaming, flocculation, coalescence and sedimentation . Mainly GRAS (Generally regarded as safe) Nanoemulsion, formulated with oil, surfactant and co-surfactant are nontoxic, nonirritant and approved for human consumption that are "generally recognized as safe" by the FDA  (Table 1). Table 1. Formulation ingredients of Nanoemulsion . Long-lived metastable nanoemulsions are considered somewhat conflict compare to those thermodynamically stable microemulsions, also known as lyotropic microemulsion phases . Nanoemulsion are fine oil/water or water/oil (depends of type of formulatory system one want to owe) dispersion stabilized by an interfacial film of surfactant molecules having droplet covering the size range in nm, due to their characteristic size Nanoemulsion appear transparent or translucent to the naked eye . Nanoemulsions are kinetically as well as thermodynamic stable systems which intern imparts good physical stability. Nanoemulsion incorporates very high concentration of surfactant which is selected from the list of generally regarded as safe agent (GRAS). If they are mixed with oil and other formulating components (Table 1) in an appropriate ratio one can avoid avoid destabilization process like Oswald ripening . The dispersed phase mainly aqueous phase is practically immiscible with the dispersed medium like oil and/or lipid. Interfacial tention has been minimized in such systems by film formation around oil droplets by amphiphiles like cosurfactant and surfactant. Mainly oils are selected which are of low carbon chain length and they can form stable system with amphiphiles. The concentration of surfactant gears the system towards nano size [11,12]. Many a times a high shear rates apply to form nano sized globules . As system tend to form the nano globules due to shear which governs the movement of amphiphiles to the nano sized globules . Main components (Table 1) of this system are same as the components of microemulsion system , oil or lipid components, Surfactant, Cosurfactant, aqueous phase and additives like consistency binder and permeation enhancer [5,8,14-17]. Nanoemulsion can be formulated (Figure 1) with variety of technique like High-pressure homogenization, Ultrasonication, Microfluidization and Titrimetric method . 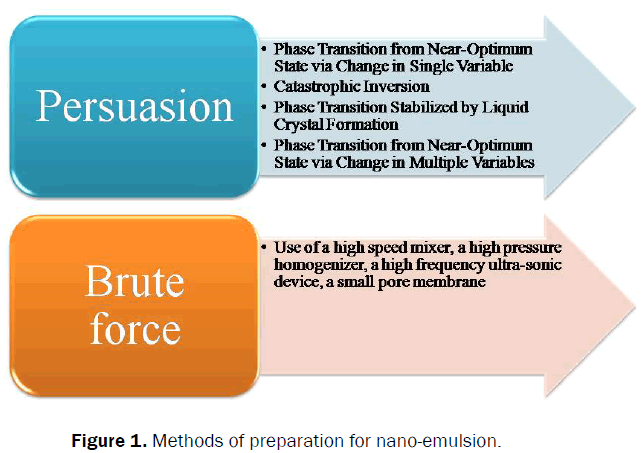 Figure 1: Methods of preparation for nano-emulsion. In order to graft a stable emulsion a large number of factors must be controlled by a formulator. Starting from composition selection, order of addition to method of shear has to be controlled. The dispersed phase molecules must be essentially insoluble in the continuous phase so that Ostwald ripening does not occur rapidly despite the very high Laplace pressures. Suppressing Ostwald ripening can be achieved by other means , but choosing a very insoluble liquid for the dispersed phase is the easiest method. Selection of Surfactant is also quiet keen as it may form Microemulsion through the formation of lyotropic liquid crystalline state . The third requirement is that the continuous phase has a significant excess of surfactant. This excess enables new surface area of the nanoscale droplets to be rapidly coated during emulsification, thereby inhibiting shear-induced coalescence. In short it forms micelles which adsorbs on to oil droplets and impart stability. Extreme shear stresses in combination with the appropriate liquids and surfactant are rarely found in natural environments on the earth’s surface. In areas where oil seeps into the oceans, natural emulsions made by wave action are common, but droplet sizes rarely become submicron. Application of extreme shear must be used to generate nano droplets. Typically, the stress level must reach the Laplace pressure of droplets having the desired size, usually in the range of 10-100 atm. The amount of surfactant required for micelle formation can be roughly estimated by assuming an equilibrium surface density, ρs, for surfactant molecules on the droplet interfaces. Once nanoemulsions have been formed, it is possible to manipulate them in a variety of useful ways. Polydisperse nanoemulsions can be separated by size into several more monodisperse nanoemulsions in a process known as fractionation. A kinetic stability that lasts for months, stability against dilution or even against temperature changes, totally unlike the (thermodynamically stable) microemulsions . Emulsions are thermodynamically unstable systems, due to the free energy of emulsion formation (ΔGf) greater than zero. The large positive interfacial energy term (λΔA) outweighs the entropy of droplet formation (TΔSf), also positive. The terms λ and ΔA respectively represent the surface tension and the surface area gained with emulsification. Emulsion instability is therefore induced by the positive sign of ΔGf (Equation 1). Destabilization of emulsions is associated with its natural tendency towards a minimal interfacial area between the two immiscible phases which can be achieved by two mechanisms: (i) Flocculation followed mostly by coalescence, and (ii) Ostwald ripening. In nano-emulsion systems, flocculation is naturally prevented by steric stabilization, essentially due to the sub-micrometric droplet size. In short, when interfacial droplet layers overlap, steric repulsion occurs, from two main origins [3,19,20]. The first one is the unfavorable mixing of the stabilizing chain of the adsorbed layer, depending on the interfacial density, interfacial layer thickness δ, and Flory–Huggins parameter χ (which reflects the interactions between the interfacial layer and solvent). The second one is the reduction of the configurationally entropy, due to the bending stress of the chains, which occurs when inter-droplet distance h becomes lower than δ. Decrease of free energy will result in the decrease of the interfacial area due to which larger dispersed droplets forms from the smaller ones, owing to the higher solubility in the bulk of the smaller droplets which is known as Ostwald ripening and it will increase throughout the process . In processes involved in nanoparticle engineering, i.e., for multicomponent emulsion droplets, by adding monomer, polymer, or simply surfactant or co-surfactant, the above approximation is surpassed. The rate of ripening can be reduced by several orders of magnitude when the additive has a substantially lower solubility in the bulk phase than the main component of the droplet. This phenomenon has been widely studied [3,22-24], since it appears to be an efficient method to reduce the Ostwald ripening rate, even when using small amounts of additives. In short, it is explained by the difference of solubility in the continuous phase between the dispersed phase noted (1) and the additive (2), less soluble in this example. The first step remains similar to the ripening without additives, since only the component (1) diffuses from the smaller to the larger droplets, due to the higher chemical potential of the materials within the smaller drops. Gradually, the chemical potential in the larger droplets increases due to the presence of the component (2), until the diffusion process of (1) is stopped. Equilibrium is reached between the two opposing effects and the limiting process becomes the diffusion of the less soluble additive (2), significantly reducing the ripening rate and the nanoemulsion destabilization. Ostwald ripening is a diffusion-controlled process, but this assumption does not take into account the fact that surfactants, polymeric emulsifiers or stabilizers can create a thick steric barrier at the droplet interface which reduced inner diffusion rate [23,24]. The unique qualities and performance of nanoparticles as devices of drug delivery arise directly from their physicochemical properties. Hence, it is keen to understand and determine them to characterize its behavior. A good understanding allows prediction of in vivo performance as well as allowing particle design, formulation development, and process troubleshooting to be carried out in a rational fashion . It will includes characteristics such as thermodynamic stability testing [8,9,16,26], Dilution stability [22,27], Transmittance measurement [8,28], Globule size distribution [15,28], Zeta potential  and in vitro assay. Apart from that it should be evaluated for pH, conductivity, refractive index etc. Nanoemulsion is useful in many fields which are described in this section. Patents related to nanoemulsions are listed in Table 2 while Table 3 describes the marketed nanoemulsion formulations. Many enzymatic and biocatalytic reactions are conducted in pure organic or aqua-organic media. Biphasic media are also used for these types of reactions. The use of pure a polar media causes the denaturation of biocatalysts . a) Increased solubility in non-polar reactants. b) Possibility of shifting thermodynamic equilibria in favour of condensations. c) Improvement of thermal stability of the enzymes, enabling reactions to be carried out at higher temperatures. Many enzymes, including lipases, esterases, dehydrogenases and oxidases often function in the cells in microenvironments that are hydrophobic in nature. In biological systems many enzymes operate at the interface between hydrophobic and hydrophilic domains and these usually interfaces are stabilized by polar lipids and other natural amphiphiles. Enzymatic catalysis in nanoemulsions has been used for a variety of reactions, such as synthesis of esters, peptides and sugar acetals transesterification; various hydrolysis reactions and steroid transformation. The most widely used class of enzymes in microemulsion-based reactions is of lipases. Nanoemulsion is used as vehicle for controlled delivery and as effective transport vehicle. It will reduce Trans-epidermal water level. Kemira Nano gel-nanoemulsion based carrier system is a patented system for cosmetic purpose it will enhance skin production and penetration of API. Apartfrom that it will also provide good skin feel . Topical administration itself has many advantages and by combining it with nanoemulsion this formulatory may impart the better way of drug delivery system. It can bypass the hepatic first pass metabolism of the drug and related toxicity effects [28,30]. One can achieve the targeted delivery by compilation delivery site and this formulation is helpful for this purpose . The nanoemulsion with the topical antimicrobial agent is helpful for the fungal infection on internal body part [5,28]. These are O/W Type nanoemulsions with size range from 200-600 nm and are stabilized by surfactants and alcohol. They are having broad spectrum of activity against bacteria and viruses even spores. Fuse with lipid containing organisms due to charge interaction . Based on its antimicrobial property research has begun to use it in the prophylactic treatment. Research has made to use it for anthrax and ebola. It has also been tested by US army on gangrene and Clostridium botulinum . A nano-emulsion based non-toxic disinfectant cleaner has been developed by envirosystem Inc. It has broad specrum of activity and kills virus, bacteria, spores, fungi and tuberculosis bacilli. It requires no warning labels. It doesn’t irritate eyes. Parachlorometaxylenol (PCMX) is one kind of such NE marketed as EcoTruTM . Briji-700 prolongs the retention of gadolinium after i.v D1-179 melanoma in hamster. Use of Soybean oil yielded highest concentration in blood. PCL-NE For deeper skin penetration with absolute BA of 70.62% has been used. Nasal delivery of risperidon to brain has been successfully achieved through this approach. It can also be used along with photodynamic therapy (PDT) . If droplet size lower than 1 micrometer it is quite obvious that 100 % bioavailability can be achieved . Nanoemulsion of nutritionals substance like Fats, Carbohydrates, and Vitamins etc., is useful and can be primitive approach [19,24]. Lipid nanoemulsion has been widely explored for parentral delivery of drugs. Delivery of vaccine and recombinant human protein (biotechnology product), targeted delivery of anti-cancer etc., can be achieved by this system via parenteral route. Nanoemulsion based Influenza and HIV vaccine is on phase 2 clinical trial. Facilitate uptake by antigen-presenting cells is seems to be its mechanism of action. University of Michigan have developed Nanobio® an O/W nanoemulsion mixed with virus. Oral nanoemulsion formulations offer the several benefits over conventional oral formulation [8,23,33]. Due to presence of lipid in formulation it is able to dissolve lipophilic drug to maximum and it is further stabilize by surfactant molecule so dose will directly educed and toxicity can be omitted which is dose dependant . Pharmaceutical drugs of peptides and proteins are highly potent and specific in their physiological functions and they can be protected from the digestive enzyme by incorporating into oil matrix with the help of nanoemulsion . Nanoemulsion is slightly viscous and having better permeation compared to other formulation [17,32]. For the treatment of eye diseases, drugs are essentially delivered with improved contact time. Ocular administration with O/W nanoemulsions have been useful because it can soluble lipophilic drugs, increase absorption and to attain prolong release profile . Nanoemulsion can be used as a tamplet for the large variety of nanomeric system which further can be used as drug delivery vehicle. From an absorption point of view, SNEDDSs are potent inoral bioavailability enhancement. However, the pharmacokinetic profiles of SNEDDSs have inherent drawbacks. Generally, lipid-based delivery systems undergo significant digestion in the gastrointestinal tract after oral administration. Owing to their smaller particle size, nanoemulsions reconstituted from SNEDDS can be digested quickly, thus achieving much quick absorption . its pharmacokinetic is somewhat same as that of conventional oral dosage form. Some of its tamplete applications are mentioned below. After administration of capsules containing conventional liquid SE formulations, microemulsion droplets form and subsequently disperse in the GI tract to reach sites of absorption. However, if irreversible phase separation of the microemulsion occurs, an improvement of drug absorption cannot be expected. For handling this problem, sodium dodecyl sulfate was added into the SE formulation. With the similar purpose, the supersaturatable SEDDS was designed, using a small quantity of HPMC (or other polymers) in the formulation to prevent precipitation of the drug by generating and maintaining a supersaturated state in vivo [34,35]. SEDDS are usually prepared in liquid form, and therefore have to be administered in a soft gelatin capsules, resulting in higher production costs and lower stability, lower portability, and lower drug loading. This problem led to the development of solid SEDDS, which combine the advantages of conventional SEDDS (i.e., enhanced solubility and bioavailability) with those of solid dosage forms (e.g., low production cost, convenience of process control, high stability and reproducibility, and better patient compliance). The solid SEDDS focus on the incorporation of liquid/semisolid ingredients into powders, employing diverse solidification techniques such as spray drying, melt granulation, molding, melt extrusion, and nanoparticle technology. The powders can then be formulated as solid dosage forms such as self-emulsifying tablets and self-emulsifying pellets. Alternative approaches for the development of solid SEDDS include adsorption by solid carriers such as microcrystalline cellulose, colloidal silica, and various viscosity grades of HPMC, and the use of high-melting-point solid excipients such as LutrolR and GelucireR [36-39]. Despite of improvement in bioavailability of poorly water soluble drugs certain manufacturing difficulties and stability problems existed. Self-emulsification is the best solution for that SE excipients have the potential to increase further the absorption of poorly water-soluble drugs.SE excipients like Gelucire1 44/14, Gelucire1 50/02, Labrasol1, Transcutol1 and TPGS (tocopheryl polyethylene glycol 1000 succinate) have been widely used in this field [40-42]. Combinations of lipids and surfactants have presented great potential of preparing SE tablets that have been widely researched. In order to reduce significantly the amount of solidifying excipients required for transformation of SEDDS into solid dosage forms, a gelled SEDDS has been developed by Patil et al. In their study, colloidal silicon dioxide (Aerosil 200) was selected as a gelling agent for the oil‐based systems, which served the dual purpose of reducing the amount of required solidifying excipients and aiding in slowing down of the drug release. SE tablets are of great utility in obviating adverse effect, as disclosed by Schwarz in a patent [36-39]. Pellets, as a multiple unit dosage form, possess many advantages over conventional solid dosage forms, such as flexibility of manufacture, reducing intrasubject and intersubject variability of plasma profiles and minimizing GI irritation without lowering drug bioavailability. Thus, it is very appealing to combine the advantages of pellets with those of SEDDS by SE pellets. SES contained monodiglycerides and Polysorbate 80. There is another report that SE sustained‐release matrix pellets could be successfully formulated with glyceryl palmito‐stearate (Gelucire 54/02) and glyceryl behenate (Gelucire 70/02) [43,44]. Zedoary turmeric oil (ZTO; a traditional Chinese medicine) exhibits potent pharmacological actions including tumor suppressive antibacterial, and antithrombotic activity. With ZTO as the oil phase, 76 prepared solid SE sustained-release microspheres using the quasi-emulsion–solvent-diffusion method of the spherical crystallization technique. ZTO release behavior could be controlled by the ratio of hydroxypropyl methylcellulose acetate succinate to Aerosil 200 in the formulation [36,45,46]. Nanoparticle techniques have been useful in the production of SE nanoparticles. Solvent injection is one of these techniques. Glygerylmonooleate, chitosan, poly-lactide-co-glycolide and polyvinyl based polymers are some of the elements registered their utility in preparation of nano particles. This approach yielded nanoparticles (about 100 nm) with a high drug loading efficiency of 74%. The SE property of GMO enhanced the solubility of PTX and provided a foundation for chitosan aggregation, meanwhile causing near 100% loading and entrapment efficiencies of PTX [46,47]. Research into SE implants has greatly enhanced the utility and application of SSEDDS. As an example, 1, 3-bis (2- chloroethyl)- 1-nitrosourea (carmustine, BCNU) is a chemotherapeutic agent used to treat malignant brain tumors . The formulation included glycyrrhizin and a mixture of a C6–C18 fatty acid glycerol ester and a C6–C18 fatty acid macrogol ester is used for chronic hepatic diseases as SE Suppositories (Tables 2 and 3). Nanoemulsion can potentially be used for enhanced drug dissolution and bioavailability, enhanced cellular uptake, improved tumor targeting, and diagnostic purposes. The public, although moderately knowledgeable about nanotechnology, perceive health benefits as the primary advantage of nanotechnology- based products. While there are ethical issues with respect to the accessibility of products of nanotechnology to the common man, the emergence of new ethical issues is unlikely with this technology. Toxicity of airborne nanoparticles, although a concern, given the prior development of nanoparticle- based products for pharmaceutical purposes, is unlikely to be a major issue. Also, the public is of the opinion that the benefits of the technology will outweigh the risks. The FDA takes a risk-based management approach for products of new technologies. The manufacturers are ultimately responsible for developing safe and efficacious pharmaceutical products based on nanoparticles [11,13,33]. The aim of this review is to duly focus on nanoemulsion as drug delivery vehicle. Nanoemulsion formulations offer several advantages for the delivery of drugs, biological, or diagnostic agents and able to protect labile drug, control drug release, increase drug solubility, increase bioavailability and reduce patient variability. Lipophilic molecules are cardinal component and dissolve the drug, this whole mixture have increasing attention as colloidal carriers (size less than 100 nm). The diverse nanonization strategies provide flexible options to develop tailor-made nano therapeutics for different drugs and administration routes. These techniques can also be used to revive the clinical efficacy of toxic drugs or facilitate the clinical translation of drug candidates that are deemed failures simply because of lack of solubility. Paolino D and Webster J. Encyclopedia of Medical Devices and Instrumentation. Drug delivery. 2006;437-487. D’Souza S. A Review of In Vitro Drug Release Test Methods for Nano-Sized Dosage Forms. Adv Pharm. 2014;1-12. Anton N and Saulnier P. Design and production of nanoparticles formulated from nano-emulsion templates-a review. J Control Release. 2008;128:185-199. Ali JAA, et al. Design development and evaluation of novel nanoemulsion formulations fortransdermal potential of Celecoxib. Acta Pharm. 2007;57:315–332. Bouchemal K, et al. Nano-emulsion formulation using spontaneous emulsification: solvent, oil and surfactant optimization. Int J Pharm. 2004;280: pp 242. Amiji MM and Tiwari SB. Nanoemulsion formulations for tumor-targeted delivery. Nanotech for Cancer Ther. 2006;723-39. Anna CP, et al. Nanoemulsion of the oil water type, useful as an ophthalmic vehicle and process for the preparation thereof Assignee. Laboratorio Cusi SA (Barcelona, ES). 1997. Sinha MKB, Ganesh N. Preparation and characterization of nanoemulsion based on papaya seed oil. Vivo Scientia. 2015;4:72-76. Tadros TF. Formation and stability of nanoemulsions. Adv Colloid Interface Sci. 2004;108:303-318. Pouton CW and Porter CJ. Formulation of lipid-based delivery systems for oral administration: materials, methods and strategies. Adv Drug Deliver Rev. 2008;60:625–637. Gordon EM, et al. First clinical experience using a ‘pathotropic’ injectable retroviral vector (Rexin-G) as intervention for stage IV pancreatic cancer. Int J Oncol. 2004;24:177–185. Nicolas ATF and Vandamme T. Nano-emulsions and Microemulsions: Clarifications of the Critical Differences. Expert Review. 2010. Anzai Y, et al. Evaluation of neck and body metastases to nodes with ferumoxtran 10-enhanced MR imaging: phase III safety and efficacy study. Radiology. 2003;228:777–788. Tenjarla S. Microemulsions: An overview and pharmaceutical applications, Critical Review in Therapeutic. Drug Carrier Syst. 1999;16:461–521. Shafiq un Nabi S, Formulation development and optimization using nanoemulsion technique: Atechnical note. AAPS Pharm Sci Tech. 2007;8:E1-E6. Guglielmini G. Nanostructured novel carriers for topical application. Clin Dermatol. 2008;26:326-331. Tadros TF. The Effect of Polymer on Dispersion Properties. Polym adso Colloid Stab. 1982. Kahlweit M. Ostwald ripening of precipitates. Adv Colloid Interface Sci. 1975;5:1–35. Higuchi WI and Misra J. Physical degradation of emulsions via the molecular diffusion route and the possible prevention thereof. J Pharm Sci. 1962;51:459-466. Buscall R, et al. The effect of long-chain alkanes on the stability of oil-in-water emulsions, the significance of ostwald ripening. Colloid Polym Sci. 1979;257:636–644. Smith S, Davis S. Proceedings: the role of molecular diffusion in the bulk stability of o-w hydrocarbon emulsions. J Pharm Pharmacol. 1973;25:117. Haskell R. Physical Characterization of Nanoparticles. Nanopart tech drug delivery. 2012; 159:126-132. Sarwar B. Development, Optimization, and Characterization of Solid Self-Nano emulsifying Drug Delivery Systems of Valsartan Using Porous Carriers. AAPS Pharm Sci Tech. 2012;13:1416-1427. Shakeel F and Shafiq S. Nanoemulsions as vehicles for transdermal delivery of aceclofenac. AAPS Pharm Sci Tech. 2007;8:E104-E109. PNMSaDR Self-nanoemulsifying granules of ezetimibe: Design, optimization and evaluation. European J Pharm Sci. 2008;35:183-192. Sheikh SN, et al. Formulation Development and Optimization Using Nanoemulsion Technique: A Technical Note. AAPS Pharm Sci Tech. 2006;8:E1-E6. Kumar S. Role of nano-emulsion in pharmaceutical sciences-a review. Asian J Res Pharm Sci Biotech. 2014;2:1 - 15. Kayser O, et al. Formulation of amphotericin B as nanosuspension for oral administration. Int J Pharm 2003;254:73–75. RNGe Self-emulsifying drug delivery systems (SEDDS), Dossier: Drug delivery and drug efficacy. Biomed & Pharm. 2004;58:173–182. A theoretical basis for a biopharmaceutical drug classification: the correlation of in vitro drug product dissolution and in vivo bioavailability. Pharm Res 1995;12:413-420. Jannin V. Approaches for the development of solid and semi-solid lipid-based formulations. Adv Drug Del Rev 2008;60:734-746. DHOe Comparison of solid self-micro emulsifying drug delivery system (solid SMEDDS) prepared with hydrophilic and hydrophobic solid carrier. Int J Pharm. 2011;420:412–418. Tao Yi JW, et al. Controlled poorly soluble drug release from solid self-microemulsifying formulations with high viscosity hydroxypropyl methylcellulose. European J pharm sci. 2008:1-7. Youn GS, et al. Development of docetaxel-loaded solid self-nanoemulsifying drug delivery system (SNEDDS) for enhanced chemotherapeutic effect. Int J Pharm. 2012;452:412-420. SCe Lipid–An emerging platform for oral delivery of drugs with poor bioavailability. European J Pharm Biopharm. 2009;73:1-15. Kohsaku KTY, et al. Microemulsion formulation for enhanced absorption of poorly soluble drugs I. Prescription design. J Control Release. 2002:81:65-74. STe Microemulsions: A Novel Approach to Enhanced Drug Delivery. Recent Patents on Drug Delivery & Formulation. 2008;2:238-257. EFe Self-emulsifying pellets in a lab-scale high shear mixer: Formulation and production design. Powder Tech. 2011;207:113-118. FMe Review on Microemulsion as Futuristic Drug Delivery. Int J Pharm Pharm Sci. 2013;5:39-53. Chavda VP. ARE SMEDDs AND SNEDDs Same? A gimmick or pharmaceutically relevant. Mintage J Pharm Medl Sci. 2012;1:1-4. VCe Lipid Based Delivery Systems: One Step Ahead in Improving Solubility of Poorly Soluble Drugs. Inventi Rapid: NDDS. 2012;4:1-21. DABe Formulation and evaluation of solid self micro emulsifying drug delivery system using aerosil 200 as solid carrier. Int Current Pharm J. 2012;1:414-419. Vergote GJ, et al. An oral controlled release matrix pellet formulation containing nano crystalline ketoprofen. Int J Pharm. 2001;219:81-87.